What is the Odometer Reading?The Odometer Reading is displayed on the vehicle's dashboard and shows the total number of miles or kilometers that the car has traveled. Enter the vehicle Odometer Reading at the time of sale.What is the Vehicle Identification Number (VIN)?The VIN is a number that is assigned to every vehicle and can contain both letters and numbers. VINs are used in New Zealand, Australia, Europe, the United States, Canada and other countries. Vehicles that have been manufactured since 1980 will contain a VIN number that is 17 characters long. The VIN can be used to determine information about a vehicle, such as the: country and year of production, manufacturer, style, make, model, engine type, etc. It is usually located in the door frame of the front doors, on the engine, around the steering wheel, or on the dash near the window. No two vehicles in the world have the same VIN number, so the VIN number clearly distinguishes one vehicle from all other vehicles. 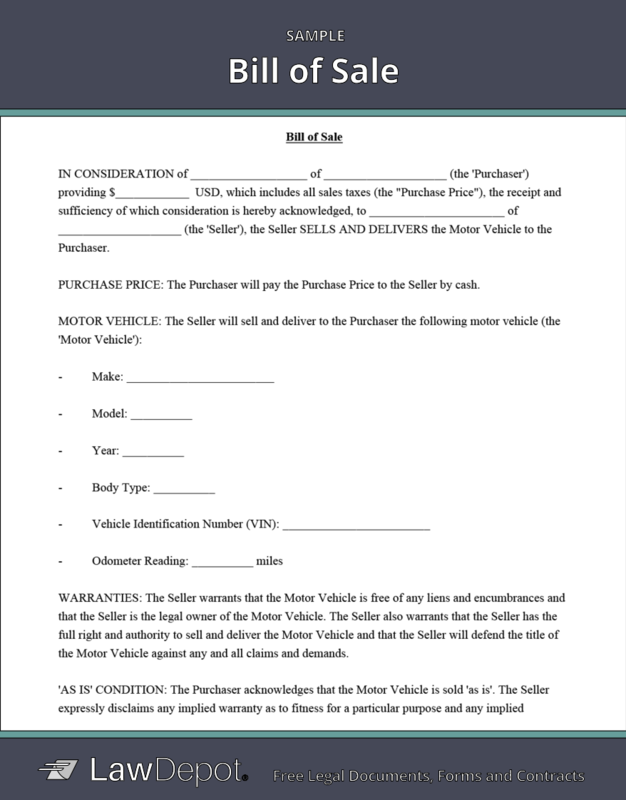 IN CONSIDERATION of ___________________ of ____________________ (the 'Purchaser') providing $____________ USD, which includes all sales taxes (the "Purchase Price"), the receipt and sufficiency of which consideration is hereby acknowledged, to ______________________ of ____________________ (the 'Seller'), the Seller SELLS AND DELIVERS the Motor Vehicle to the Purchaser. PURCHASE PRICE: The Purchaser will pay the Purchase Price to the Seller by cash. WARRANTIES: The Seller warrants that the Motor Vehicle is free of any liens and encumbrances and that the Seller is the legal owner of the Motor Vehicle. The Seller also warrants that the Seller has the full right and authority to sell and deliver the Motor Vehicle and that the Seller will defend the title of the Motor Vehicle against any and all claims and demands. 'AS IS' CONDITION: The Purchaser acknowledges that the Motor Vehicle is sold 'as is'. The Seller expressly disclaims any implied warranty as to fitness for a particular purpose and any implied warranty as to merchantability. The Seller expressly disclaims any expressed or other implied warranties. WORKING ORDER: Any warranty as to the condition or working order of the Motor Vehicle is expressly disclaimed by the Seller. MANUFACTURER'S WARRANTY: Any disclaimer of warranties by the Seller in this Bill of Sale will not in any way affect the terms of any applicable warranties from the manufacturer of the Motor Vehicle. LIABILITIES: The Seller does not assume, nor does the Seller authorize any other person on the behalf of the Seller to assume, any liability in connection with the sale or delivery of the Motor Vehicle. INSPECTION: The Purchaser accepts the Motor Vehicle in its existing condition given that the Purchaser has either inspected the Motor Vehicle or was given the opportunity to inspect the Motor Vehicle but chose to not inspect it. GOVERNING LAW: This Bill of Sale will be construed in accordance with and governed by the laws of the Commonwealth of Virginia. this 20th day of April, 2019. Federal and State Law requires that the Seller state the Mileage upon transfer of ownership. Failure to complete or providing an inaccurate or untruthful statement may result in fines and/or imprisonment. I CERTIFY that to the best of my knowledge the odometer reading as stated above reflects the actual mileage of the Motor Vehicle and that the odometer of the Motor Vehicle was not altered, set back, or disconnected while in my possession, and I have no knowledge of anyone else doing so. A Bill of Sale is a form that a seller uses to document the sale of an item to a buyer. It serves as a receipt for personal sales and purchases and includes buyer and seller information and details about the goods, their location, and the price. Both parties should fill out and retain a copy of the signed Bill of Sale as a proof of purchase or as a proof of payment. A Bill of Sale should only be used for "as-is" purchases when payment in full will be made once the item is exchanged, and both parties accept to buy and sell the item in its current condition. It expressly disclaims any warranties that relate to the quality or fitness of the product. If you are looking for a contract that includes more specific terms, provides warranties or you wish to have full payment made after the item is provided, LawDepot also offers a Sales Agreement form. What does "as-is" mean in a Bill of Sale? "As-is" is an important term in a Bill of Sale form. It means that the item was bought and sold in its current condition and that the buyer is accepting the item with all of its faults, whether they are apparent or not. "As-is" protects the seller from having to refund the buyer for any item-related issues after it was received and paid for. Why should I use a Bill of Sale? A Bill of Sale is used to protect both the seller and the purchaser in the case of any future issues. Since many purchases and sales between individuals are transacted using cash, it can be hard to prove that an item was received or paid for without proper documentation. What can you use a Bill of Sale for? Can I use a Bill of Sale as a receipt for services? It is not recommended that you use a Bill of Sale in instances where there isn't a transfer of ownership since a Bill of Sale is best used for the sale and purchase of physical goods. When providing or hiring services, it's more appropriate to use a document like a Service Agreement or an Independent Contractor Agreement. It should also be noted that you can't use a Bill of Sale to transfer the ownership of or the title to a piece of real estate. In such instances, you'll likely need a Quitclaim Deed or a similar document. Who should use a Bill of Sale? Using a Bill of Sale is recommended even when selling or trading items with friends or family members because of the document's power to show proof of ownership. For example, if a parent gifts or sells their vehicle to their child, the child will need a Bill of Sale to prove their ownership of the car so they can get it registered and insured. Purchase of Business Agreement: A Purchase of Business Agreement records the purchase of all the shares or assets of a business. Quitclaim Deed: A Quitclaim Deed is a document used to transfer a property title from one party (the grantor) to another (the grantee), and it is most commonly used when the two parties know each other well (e.g. family or friends). Real Estate Purchase Agreement: A Real Estate Purchase Agreement documents the purchase and sale of real estate property. Sales Agreement: A Sales Agreement contract is very similar to a Bill of Sale, but includes more details about the purchase and warranties, as well as the option to accept payments over time. Service Agreement: A Service Agreement is used to outline the terms of a contract where one party provides a service for another. Personalize your Bill of Sale template. Know someone who's selling some of their items?